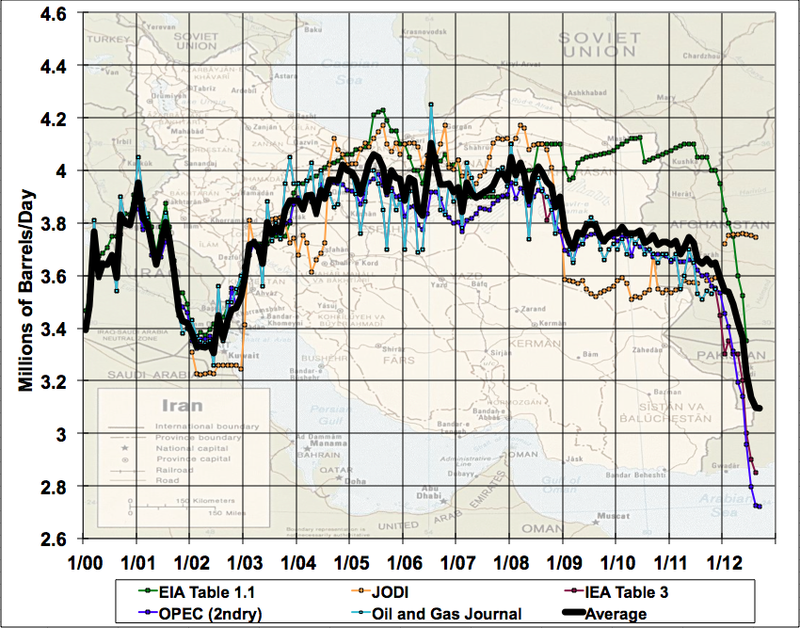 The above shows the available public data on Iranian oil production as of this moment. The slide continues. 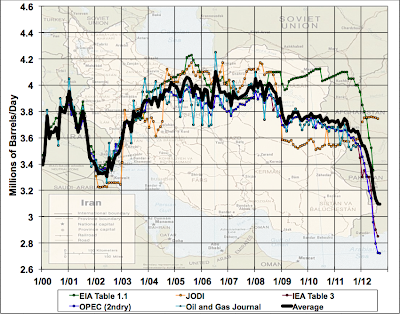 You may wonder if there's a little sign of stabilization in the OPEC secondary numbers in the last month, but the previous month also showed that sign but then it got revised away. So I think for now we should hold judgement on that. Yesterday in Luxembourg, EU foreign ministers approved the improvements to the sanctions which close existing loopholes, and will focus on the finance, energy, and transport industries. They also took action to freeze the assets of 34 Iranian corporations in an attempt to restrict the ability of Ahmadinejad’s government to raise funds for further nuclear research and development. WASHINGTON, Oct 19 2012 (IPS) - Last weekend’s disclosure that Iranian cyber warriors had disabled some 30,000 computers owned by the Saudi oil giant Aramco is attracting considerable attention here, particularly in light of a warning last week by Pentagon chief Leon Panetta that Washington could face a “cyber-Pearl Harbor”. The alleged Iranian hand behind the attack, first reported Saturday by the Wall Street Journal, was described as one of several forays by the increasingly sophisticated “Iran’s Cyber Army” whose existence first surfaced in 2009, according to experts here. One key element of the Aramco attack, however, has not yet been reported. Two former senior CIA officials told IPS that it appears to have been carried out with the help of personnel inside Aramco. They said that the Saudi regime has been detaining and questioning staff with access to the affected work stations. Cyber attacks on U.S. banks continued this week from suspected hackers believed to be supported by the Iranian government, according to U.S. officials. Attacks on Capital One Financial Corp. and BB&T Corp. occurred on Tuesday and Wednesday. U.S. and banking officials described them as denial of service strikes preventing customers from accessing their information from banking websites. There was little damage and no accounts were compromised, the officials said. But the banks were still not able to fully stop the attacks even though it appeared they were pre-announced by at least one group. So far, these attacks have not had a major impact on bank operations and Saudi oil production was not affected in September. However, I think it's a somewhat dangerous development. The vulnerability of the US economy to cyber-attacks is still a lot greater than has yet been capitalized on, in my opinion. Since we are placing the Iranians under very severe pressure with sanctions, they have the motivation to learn quickly and cyberattacks are very cheap. So there is some risk of them getting good enough to inflict real pain. I was always concerned that Stuxnet would be a case of us throwing the first stone while living in a glass house. Having said that, from a grand strategic perspective, it's not clear what the Iranians can really gain by further escalating the conflict with the entire world at present. If I were them, I'd be focussed on trying to somehow placate and divide my enemies while buying time to finish my nuclear weapons. Iranian cyberattacks on the US, at least at the present scale, are a bit like shooting at a grizzly with an air rifle - a lot more likely to result in being chased by an angry bear than in crippling it. US Oil Rig Boom Leveling Off?